The Fully featured Champion Sea Jet sets the standard for comfort and convenience making it one of the best watercrafts in its class. -14-Function Gauge:digital information center,with timer for total running. -L3 HULL: Designed for lighter and stronger, improved handling and stablity,resulting in smoother rides. -Fold down reboarding step: Designed for reboarding from the water easier and quicker. -B&R SYSTEM: Brake and Reverse (B & R) system offers a new way of safety and control.If the watercraft is moving forward, pull up the breake to slow down.If it's stopped, them go in reverse. -Intelligent Engine Overheat Protection(IEOP):Designed for keeping the engine much safer. 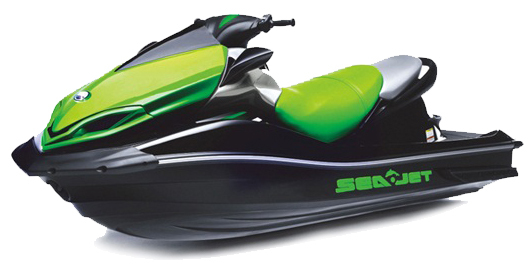 Ensures Champion Jet Ski J5B watercrafts longer life than others. CLCS uses cootant to keep the engine running at ideal temperatures-much like car's radiator.Close-loop cooling also keeps out corrosive saltwarer and debris. For greater fuel efficiency and riding confidence, and perfect for less experienced riders. The world's best brake on a watercraft, with reverse gear as well.